We're in a post-truth era. To some, this seems like a problem for preachers or theologians to fix. An inability to discern truth--or Truth, as it may be--is the result of a spiritual problem, after all. It acknowledges the irresistible elements of error, while providing a pathway by which consumers can verify or refute things that are true. But we're in a post-truth era--a secular post-truth era. The theologians and the pastors are in bed with the politicians and talk-show hosts (and God knows what else). America needs a new standard-bearer. History teachers. I'm looking at you. It is time to throw out the history books and start teaching Fake History. Nothing less than the survival of Western Civilization is at stake here. Today's history teachers are tomorrow's superheroes. Let's face it, Americans have more facts than they know what to do with. The problem is that we just don't have the tools to evaluate known facts and make judgments with certainty, the two things one needs to find Truth. With multiple sources online promoting different versions of fact--particularly as it relates to politics and current issues--the students need tools to find the truth. So, is Climate Change a thing? Did Russian intelligence undermine the 2016 U.S. Election? Did human beings interact with dinosaurs in the years before a worldwide flood? These are all ideas that are out there, promoted by multiple actors promoting "Truth." Who's to say who's right? History teachers. Science teachers. Teachers. Teachers. Teachers. A recent "story" (in every sense of the word) brought this to light. I'm friends on Facebook with a fantastic history teacher at my school. 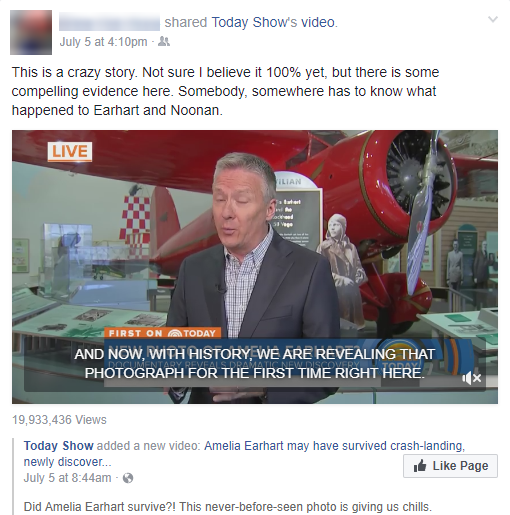 I learned from one of his posts that we're both fascinated by one of history's great mysteries: the search for Amelia Earhardt. Of course this caught my attention, too. I'm fascinated by historic mysteries, and Amelia Earhardt is among the foremost. 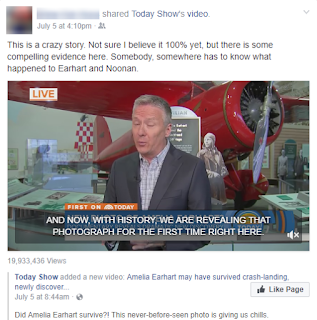 The Today Show had an exclusive on History Channel's exclusive about the mysterious photograph. This was news. Note my colleague's language in presenting the story. "Not sure I believe it 100% yet" qualifies the report and shows some reserve of judgment. "There is some compelling evidence here" shows a teacher who demands historic evidence from his students. And then the truth: "Somebody, somewhere has to know what happened to Earhart and Noonan." The discussion went forward a few rounds and ended. I haven't seen much online since the program aired. I don't have cable, so I wasn't able to watch the program myself. What can I say about this article? Well, I can't be 100% sure that it is accurate. The discreditor is a Japanese blogger--and the source is Jezebel, a women's-oriented blog without the caché of a source that calls itself "The History Channel" of all things (Jezebel, of course, was citing a report found in the newspaper, The Guardian). But I would also say that blogger, Kota Yamano, presents some pretty compelling evidence: namely, he also found the image at the heart of the History Channel's case--after a 30-minute online search for photographs of "Jaluit atoll." Oh, and there's this. 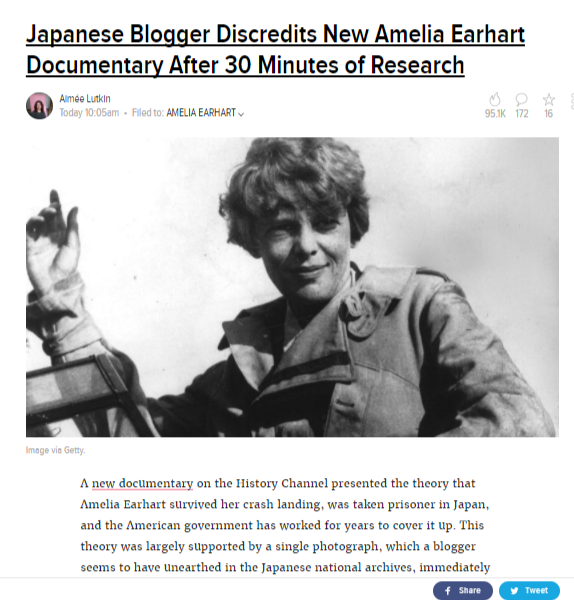 The article was published in a Japanese travelogue of the South Seas in October 1935, almost two years before Amelia Earhart and Fred Noonan disappeared in the South Pacific. I don't write this to get the last laugh or show up a good friend (and a very good teacher) at my school. To me, this is a great opportunity to define what is true in a post-truth America. To me, this affirms the importance of history teachers (as well as skilled journalists). But there's more to this than examining the History Channel sources and comparing their validity with those found by Yamano in his own search. The picture is either of two missing, kidnapped American celebrities, or it isn't. But this is where critical thinking comes in--and this is where teachers should embrace this "story" as a new method of teaching history. Where the learning comes in this story is not through watching a documentary on TV that might bring a cool conclusion to a remarkable historical mystery. The learning comes from veracity, from a commitment to the truth, and maintaining a skeptical eye in the face of a truly good story. I could see sharing both the History Channel or Today article with students, then hitting them with the Guardian article and having them work back through the grueling task of verifying evidence. There is a deeper level of teaching that we need to consider for classes of all stripes. It is time that teachers actively began faking evidence to prepare students for the real world. We live in a world where facts are at our fingertips, but knowledge all to often seems further away than ever. The word, "teach," implies the sharing of facts along with (one hopes) the context for utilizing them effectively. Yet our world has moved beyond the need of a single source of facts from a given textbook or teacher. What if history teachers moved on to providing just two things--a context from history and "their" facts--and then let students work out the truth for themselves? For example, lets say that a teacher fakes a story like the one on the History Channel: a photo implies that the Japanese (or Germans, or Italians) kidnapped one of America's most famous celebrities in 1937. What kind of evidence would students have to utilize to prove/disprove this? In pushing students to figure out whether a story is fake or not, teachers are pushing them beyond the rote level of learning into a realm of critical thinking that is essential for any 21st-century consumer of truth, whatever that means. I know a little of what I speak here. In 2015 I gave my ELA students a fake article on an American president trying to re-institute slavery, asking them to compose an argumentative essay in response. In the area of "truthiness," I must admit that the standards I had to teach with were vastly inferior to those that a history teacher has--i.e. historical documents, veracity, etc. Each of these "fake" stories has several trains of truth at the heart. There may be learning involved in trying to disprove them. But why stop at history teachers? Teachers across the secondary spectrum need to embrace Post-Truth America, and utilize the "teaching moments" it makes possible. Science teachers shouldn't discourage Intelligent Design theories. They should teach students to investigate. For example, did ancient humans cohabitate with dinosaurs? Health/PE teachers could introduce fake news stories--do students know that Coca-Cola is good for them? Heck, literature teachers could encourage students to examine whether a text has literary merit or not! I'm not writing that we need to shift every lesson to fake facts. I do think that it's time that more face news, fake literature, and fake science were introduced to the classroom. This just might result in some very real learning!